Red Mango Yogurt Café is an established leader among frozen yogurt franchises and and looks to do the same with the recent expansion into healthy cafés, and we truly enjoy helping our franchisees build strong, successful businesses and make a positive impact in their local communities. Our franchisees serve up frozen yogurt that’s healthy, low-fat or non-fat, and packed with probiotics which helps support the immune and digestive systems when consumed as part of a balanced diet and healthy lifestyle not to mention that it’s gluten-free and kosher certified. In addition, the concept has expanded into the rapidly growing market for Smoothies and Fresh Juices and has also added salads, wraps, and other light and healthy foods to generate increased sales on a year round basis. Red Mango is more than just frozen yogurt, it’s a healthy café. In addition to frozen yogurt, you’ll also serve up smoothies, parfaits, hot chocolate, cold brewed iced coffees and frozen lattes, dairy-free skinny sorbettos, fresh squeezed citrus and green juices, and other grab n’ go items. 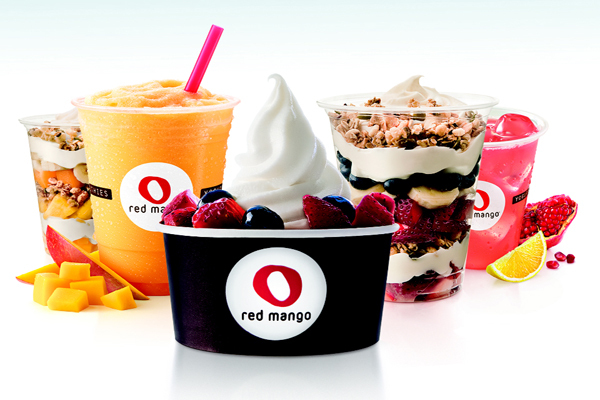 Red Mango Yogurt Café franchise is owned by parent company BRIX Holdings, a world-renowned team known for creating exceptional growth and improvement in a variety of restaurant franchises. Current holdings include Red Mango Frozen Yogurt, Smoothie Factory & RedBrick Pizza. At Red Mango, we know that our success depends on the success of our franchisees. That’s why we make it one of our top priorities to provide outstanding support and training to all of our franchisees. When you open a Red Mango Café you will receive the full support of a highly experienced team that assists locations all over the United States (and even some parts of Central and South America). When it comes to the frozen yogurt business, we’ve seen it all and as a franchisee, you’ll be able to leverage our experience and knowledge to help build your business into something you and your community can be proud of. At Red Mango, we’re looking for positive, motivated entrepreneurs who want to make a difference in their communities. We can offer training for almost anything, but there’s no substitute for a strong work ethic and a good attitude.